First published: September, 1993. First posted online: December 29, 2005. Here’s Chris thinking he’s Aragones… sigh. It’s not much better close up. On the plus side, our d-word editing allowed us to sneak the D.E.L.V.E. in from the print compilation (the term never appeared in the magazine run). “The Visions of Surfeit“ [521 kb], rejected for September, 1993. Despite it being a very sketchy rough, and unlike other Lost Episodes, we consider it canonical. 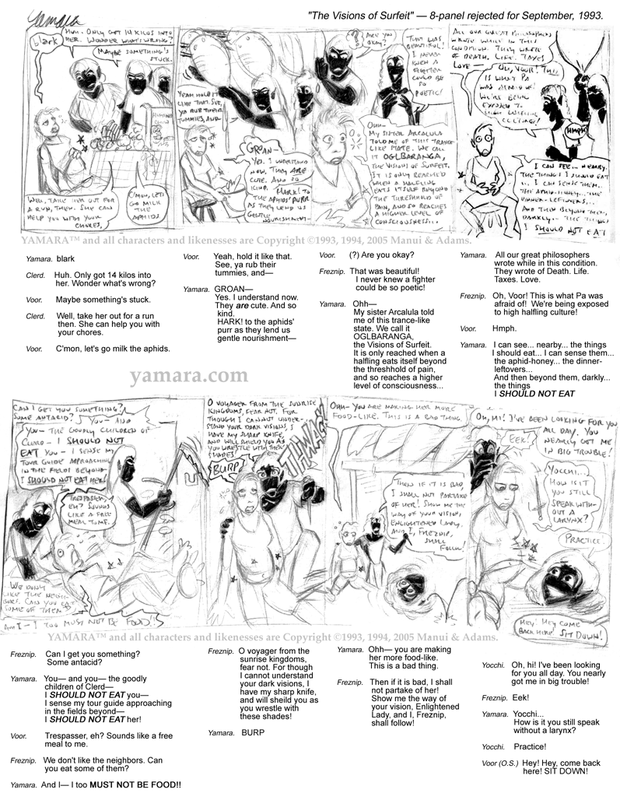 If you assume the last four panels are part of Yamara’s hallucinations. Why Not Reintroduce the Characters? So We Can Cancel You.